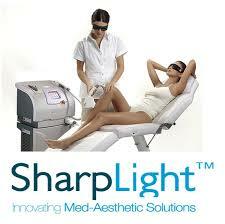 SharpLight IPL is a powerful and effective way to permanently remove undesired hair on the face or body. IPL, or Intense Pulsed Light, is a treatment that focuses powerful flashes of light to kill hair roots. Because hair grows in cycles, a course of treatments is needed. Standard time between sessions varies from 4-6 weeks. Individual results vary as hair type and growth varies from person to person.